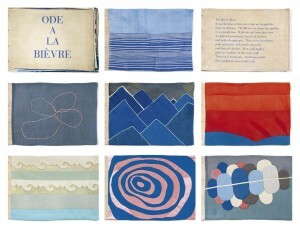 Today was an ultimate treat as I got to attend Louise Bourgeois symposium at National Scottish Galleries, Modern 1. The symposium some of the art curators and other authorities who had had a chance to work with LB in her living time and they presented papers on her. We started the day with seeing the art works. I was blown with the prolific nature and the range of media and material that LB worked in. My most favorites are the fabric works. I learned today what I am aspiring towards in my work. Simplicity yet depth. Nothing moves more than these two combined. It was such an overwhelming experience, I feel i need a long time to process it all and be able to write about what I felt, thought and learned today. The seminar was very educational too. It featured talks by many authorities who had had chance to work with LB in her living days. What must it be like to come in contact of an artist that great? Does it change something in you forever? Despite of all my awe for LB, there was something that I realized today. That ll the people were present there were in so much of awe of her that they would not entertain any question that would not be asked from someone kneeling in front of the pedestal that LB is placed upon. During one of the q&a rounds, I asked the professor who was giving the talk what was LB’s curatorial stance on her art. She worked with such vast range of material, how much authority did she exercise on how her shows were curated. My second question was what did LB had to say about the places that she displayed her work at. Did she have any thoughts or ideas about how she wanted her work to be distributed? These questions were particularly relevant to me because these are the questions I am going to address in my essay this semester- artist as curator. The answers- while first one was affirmative , the second was that LB did never have to think about where her work was displayed because she was so famous and poular that she never needed to. this was particularly amusing because their answer was laced with a tone of in-credulousness. It was almost as if they said how dare I ask something like that in regard to an artist like LB. I have come back with a question in my mind: are big artists beyond these artistic queries? Or These queries that we are studying about, they are for a new generation artists. Was it LB’s stature or the era and generation she belonged to which makes these questioning unnecessary or irrelevant?